Have you heard that you are supposed to change your air filters every 1-3 months? But how many of us actually do that? Here at Simple Filter Plan, we make changing your Air Filter simple. It takes one click to start reaping the benefits of better air quality and better AC efficiency. Choose your filter, choose your plan, and that’s it. We deliver the filter to your door at no extra cost. We knew that when people understood the benefits that come with a task as simple as changing their air filter, they’d want to do it. So, we wanted to make it as easy as possible for people to change their filters. Though it is universally recommended to change your air filter every 30-90 days, you will see benefits when you change your filter anytime during that period. What’s in it for you? The home is typically a place of safety and comfort for your family, but dirty air filters could be affecting your family’s health. It’s normal for germs, mold spores, dust, and other allergens to collect in the air. It’s your air filter’s job to remove these pollutants as it recirculates and cools the air in your home. Did you know a dirty air filter is the #1 reason for AC systems breakdowns? Changing your filter cleans your air and protects your family, but it also protects your air conditioner from dirt and pollutants. Though clean air filters will save you from long term costs of HVAC repair, you can also save in the short-term. Dirty air filters cause your system to run longer because it can’t clean the air as efficiently. Protect your family—change your filters. When your air filter is dirty, the dirt, mold and grime gets passed back into your home. This can aggravate allergies, asthma, and other health conditions. Why not let your whole family breathe better? When your air filter is dirty, the blocked airflow causes your AC unit to work harder and run longer in order to cool your home. Eventually, it will overheat and trip your breaker, or simply shut down. Save long-term and keep your AC running efficiently by replacing your filter. When you begin regularly replacing your air filter, you will begin to see immediate savings in your energy bill each month. Can’t complain about that! So what are you waiting for? Get started with a home AC filter subscription today! Unsure of which filter to choose or which size you need? Visit our FAQ page for answers and quick tutorials on DIY filter installation. Feel free to give us a call or send us an email. We know the value of customer service, and we are always here for you. Not sure which home air filter is right for you? If you are looking for a great filter that will regulate your air at a budget-friendly price, we recommend our Basic Filter. Got allergies? Have Pets? Our Advanced Filter offers powerful filtration that eliminates even the most microscopic allergens and pollutants. Want something in between? Our Premium Filter provides great airflow with a higher level of filtration than the Basic. We offer three levels of high quality air filters to fit your budget and needs. Our standard plan is a new filter every 90 days, but we also offer 30 and 60 day options. You’ll find all standard filter sizes here at Simple Filter Plan, and even some that aren’t. Unsure what to choose? Check out our FAQ or give us a call. Your filter will be delivered to your door at no extra cost, meaning you can breathe easy. Why don’t you change your air filters? It’s a hassle. We get it! Running to the store for that one extra thing that is typically out-of-sight, out-of-mind… it’s hard to remember! 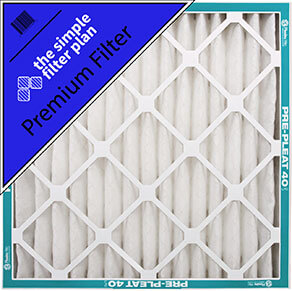 With Simple Filter Plan’s Air Filter Subscription Service you can click and forget. It’s one less thing to think about, and one simple way to live a better life.